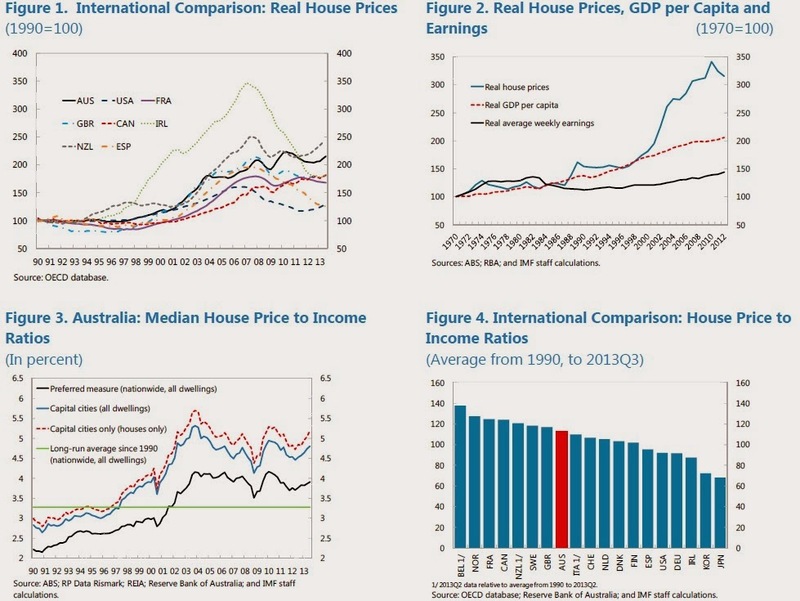 “Reflecting structural factors both shared with many other countries and unique to Australia, real house prices have roughly doubled since 1990 (Figure 1). After growing broadly in line with real GDP per capita from 1960-90, real house price inflation picked up in the 2000s and exceeded income growth for much of the period up to the global financial crisis (Figure 2). As a result, the median house price to income ratio rose sharply from around 3 at the beginning of the 2000s (when based on the authorities’ preferred measure for all dwellings) peaking at just over 4 in 2009 (Figure 3). Since then the price/income ratio has eased back and international comparisons suggest that while Australia’s is on the high side it is not out of line with peers (Figure 4). Rising house prices were also accompanied by increased household borrowing with the debt to income ratio rising from among the lowest at 46 percent in 1990 to around 150 per cent in 2013,” according to the latest IMF’s annual report on Australia.